A Few Months Back, Microsoft impressed the world with 'Microsoft loves Linux' announcements, including, development of a custom Linux-based OS for running Azure Cloud Switch and selecting Ubuntu as the operating system for its Cloud-based Big Data services. Now, a renowned Windows Hacker and computer expert, who goes by the name ‘WalkingCat’, discovered that the latest version of Windows 10 may have a Linux subsystem secretly installed inside. 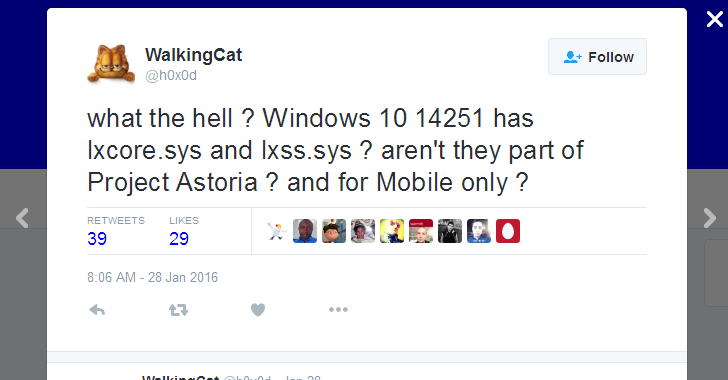 According to his tweets, hacker spotted two mysterious files, LXss.sys and LXCore.sys, in the most latest Windows 10 Redstone Build 14251, which are suspected to be part of Microsoft’s Project Astoria. Project Astoria, also known as Windows Bridge for Android, is a toolkit that allows running Android apps on Windows 10 Mobile devices. The naming convention for latest discovered files is very similar to the Android Subsystem files from Project Astoria, i.e. ADss.sys. 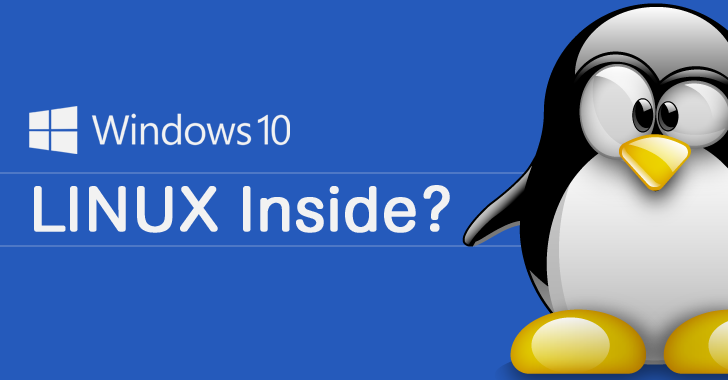 So, the "LX" in these name, however, can only be taken for one thing, and that is LINUX, which suggests the Windows 10 will have access to a Linux subsystem also. Since Windows 10 has been introduced as a Universal Operating system for all devices, so it might be possible that Microsoft wants to expand Project Astoria from mobile devices to desktop users. If this comes to be true, adding a Linux subsystem will be beneficial in case Microsoft has plans to offer support for Linux applications, especially servers related technology and software. Stay tuned to The Hacker News Facebook page for further developments on this topic.